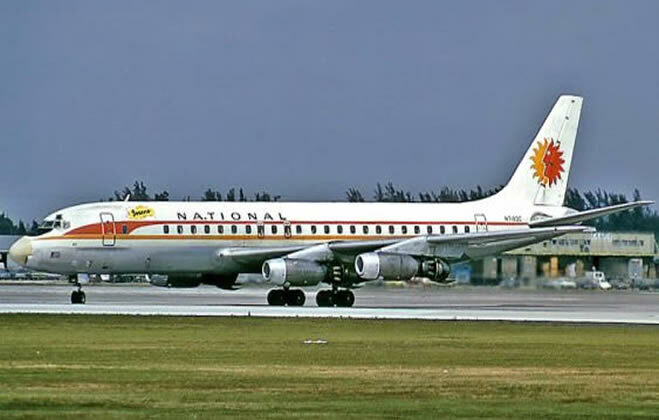 It was founded in 1934 as a Florida-based airline. November 10 of 1958, National became the first airline to introduce domestic jet service in the United States, with a flight between Miami 's international airport and Idlewild International Airport in New York. In 1964, it became the first exclusively jet powered service in the United States, and by 1970 became the third airline to offer transcontinental passenger flights. 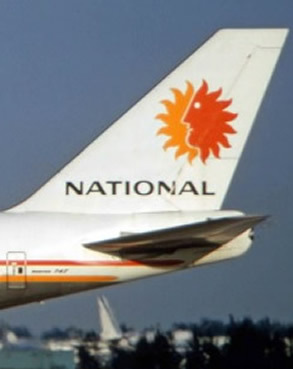 National Airlines merged with Pan Am in 1980. Pan Am paid too high a price for National, and was ill prepared to integrate National's domestic route network with Pan Am's own globe-girdling international network. The cultures of National and Pan Am also proved to be incompatible, making workforce integration difficult. Texas International walked away from their foiled attempt with a multi-million dollar stock profit and was poised for Lorenzo's next ventures—a startup airline in the high-density East coast corridor (New York Air), and subsequent acquisition of Continental Airlines. 432 in 1951, 905 in 1955, 1041 in 1960, 2663 in 1965, 2643 in 1970, 3865 in 1975. - October 5, 1945, a Lockheed Lodestar crashed into a lake in Lakeland, Florida with two fatalities. - January 14, 1951, a DC-4 crashed on landing at Philadelphia Airport with 7 fatalities. 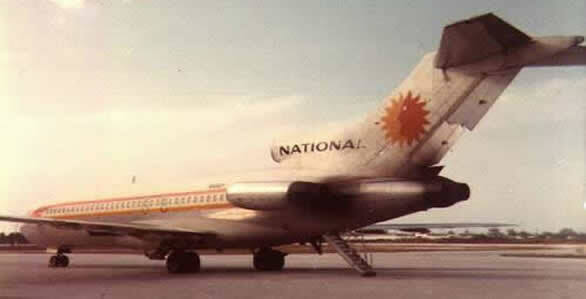 - February 11, 1952, a DC-6 crashed near Newark Airport, killing 29 out of 63 people on board. - February 14, 1953, a DC-6 crashed into the Gulf of Mexico off Mobile, AL. 46 people perished. The aircraft was crossing an area of severe weather and possibly flew into a waterspout. - November 16, 1959, a DC-7B flown on an interchange route with Delta Air Lines, in a Delta aircraft but with a NAL crew National Airlines Flight 967, en route from Tampa to New Orleans, disappeared over the Gulf of Mexico. A bomb was suspected. - January 6, 1960, a DC-6B en route from New York to Miami was destroyed by a bomb near Bolivia, North Carolina, killing all 34 on board. Suicide by a passenger holding large life insurance policies was the probable cause. - May 1, 1961, Antulio Ramirez Ortiz hijacks a National Airlines flight from Miami International Airport to Cuba. 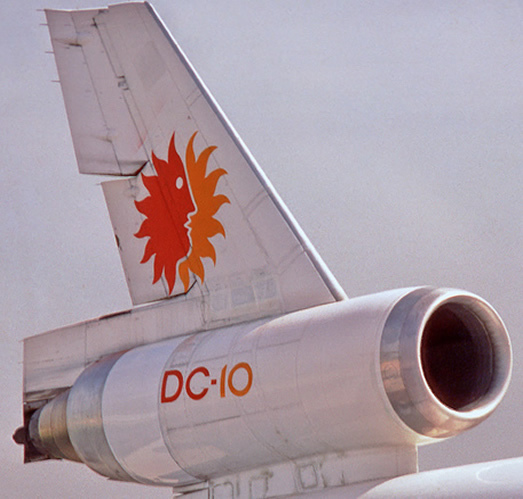 - November 3, 1973, a DC-10 had an uncontained failure of Engine #3, as a result of flight crew experimentation, shrapnel penetrated other engines and fuselage, broke window, 1 seat-belted passenger was forced from the plane and killed.